The Young and the Breadless: Introducing: Anderson voleur Chausette! 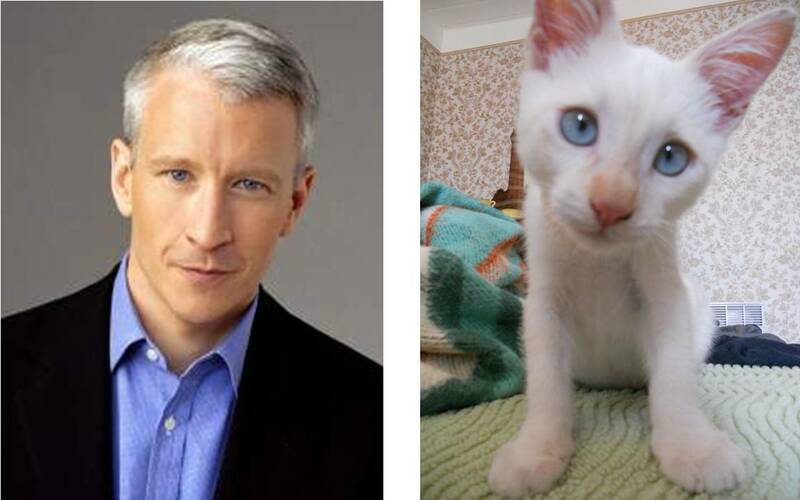 The first name "Anderson" was inspired, not by Anderson Cooper (despite his striking resemblance to my kitten) but by the phenomenon of Anderson Localization, which occurs when scattering events off of disordered media lead to wave localization rather than diffusion (In case you are curious, here is the Anderson localization wiki). As "Son et Lumiere" is primarily concerned with the behavior of sound waves, this topic has been thoroughly discussed. My kitten was, believe it or not, the (partial) inspiration for a slide at the end of Prof. John Page's talk, which described the phenomenon of Anderson localization of a cat: said cat becomes localized, rather than diffusive, when it is encounters a high density of randomly ordered scattering events: dogs, cat-haters, waitresses, cars etc. Just you wait: one day, Anderson's cat will hold a place as highly esteemed in the symbolism of science as Schrodinger's cat, and my little Anderson started it all. The middle and last names, suggested by John, mean "sock thief" in French - very fitting for my little laundry rooting kitten. Anderson v. Chaussette - it just rolls off your tongue, doesn't it? I was considering "underwear thief", but "sous-vetements" just does not have the right ring to it. But before you fall into a coma of cuteness, consider this: my little Anderson jumped on my face at 2:30 this morning, waking me up and tracking mud all over my bed. Silly cat. I will post about something not related to kittens sometime in the near future. Cheers!